The A. V. rendering of the Hebrew "oren" (Isa. xliv. 14); R. V. has "fir-tree." According to TanḦum (quoted in Gesenius, "Thesaurus," under ), the word was used in later Hebrew in the sense of "mast." 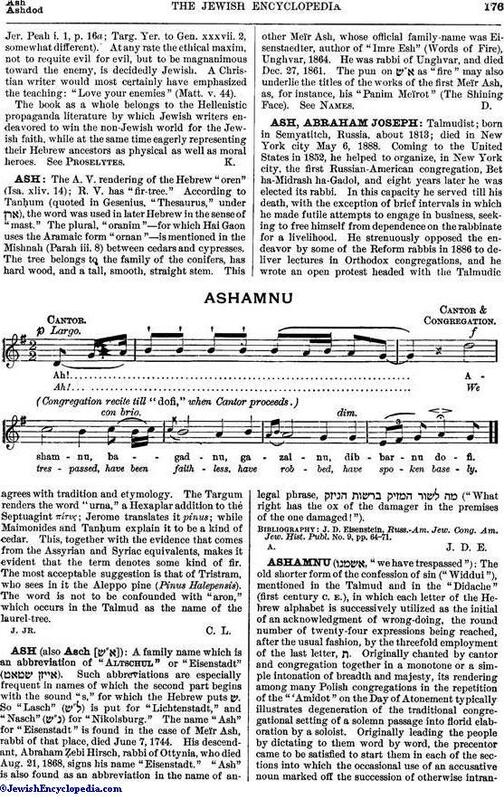 The plural, "oranim"—for which Hai Gaon uses the Aramaic form "ornan"—is mentioned in the Mishnah (Parah iii. 8) between cedars and cypresses. The tree belongs to the family of the conifers, has hard wood, and a tall, smooth, straight stem. This agrees with tradition and etymology. The Targum renders the word "urna," a Hexaplar addition to the Septuagint πίτνς; Jerome translates it pinus; while Maimonides and TanḦum explain it to be a kind of cedar. This, together with the evidence that comes from the Assyrian and Syriac equivalents, makes it evident that the term denotes some kind of fir. The most acceptable suggestion is that of Tristram, who sees in it the Aleppo pine (Pinus Halepensis). The word is not to be confounded with "aron," which occurs in the Talmud as the name of the laurel-tree.